Rudy’s been taking it easy at home since getting back from UCLA late Thursday. He’s a little achy from time to time, but a little Tylenol seems to take care of that. We’ve been very touched by Docs Dan and Nina calling personally to follow up the cath report and check on him–so assuring to have such gifted doctors who care deeply for Rudy and our family. The most interesting development since yesterday has been the massive blister that seems to be taking over Rudy’s foot. We texted a picture of it to some nurses and one of the docs who sent back “Wow! Never seen anything like that before.”. This has given us room to create our own theories: infection (not likely as the foot isn’t painful, warm or red), allergic reaction to tape (but there was tape all over him so why only there? ), or a burn from something to do with the IV (my best guess as the port was right there and something could have leaked under the dressing). More rampant and creative theories from his siblings include: an alien nesting under his skin that’s going to emerge? A collateral sixth toe (since the veins were coiled up something had to grow somewhere)? An inchworm that’s spun a cocoon on the side of his foot? 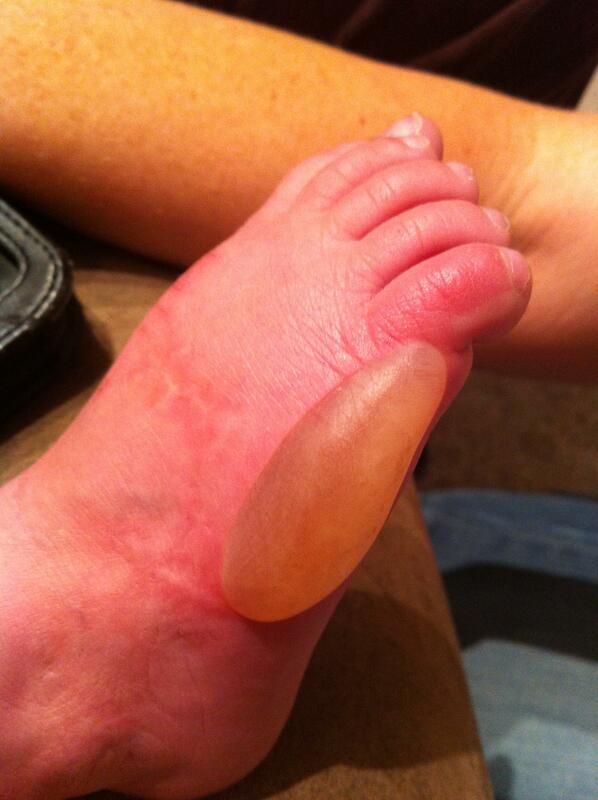 We’re not really into putting gross-out pictures on our blog, but in the name of science, here is the wondrous blister (just in case you can’t see it from your house). Feel free to submit your own theories or potential names. My goodness! It definitely looks like a burn of some sort to me, as you can see the baby toe is reddened and swollen. It is a mystery. There are also red “striations” off-shooting from the blister. It is amazing that it doesn’t bother him or cause any pain. Best be careful when it pops, as it may very well flood your entire home, LOL. I hope it all turns out to be fine when it finally heals in the end. No shoe for that footsie? Laughing out loud…”just in case you can’t see it from our house!” Oh, Rolf. You guys have the best attitudes about aliens in your midst! In the name of science, and the betterment of mankind, I am glad you posted this picture. I had already sent the shot I took from my house to edhat. I’m telling you, that is why Rudy’s O2 sats are so good, all that LAUGHING!!! Holy crap. So glad that thing doesn’t seem to hurt him – it makes my foot hurt just to look at it. And it does look like a burn of some sort. Keep yourselves girded with clean towels at all times – you never know when the flood may hit. Prayers for good healing, for relief from achiness, for peace and the spirit of Geyling playfulness to supersede all the angst and worry of the week just past. Oh my! I will be curious to see what the doctors say about that! Thanksgiving prayers for you today! Ouch!! Doesn’t look serious, but terribly awkward…..hang in there little buddy! Are you sure the big kids didn’t have Rudy in a Dancing with the Stars try-out or something? OMG! To be so large. I wonder if they used any betadine and taped over that. Good luck little, Rudester! Eeeek. Looks like when I let Heather’s baby face get a March sun-burn at 5 months old. How telling though that all of you can be calm and joke about it. You’re tough! Elephant-foot? Mr. Slug? No joking from me! Do the dozens of doctors he sees have an explanation? I would surely hate to see an infection develop when that drains. And how do we know it isn’t uncomfortable? He has been through so much one wonders what is going through his mind! It definitely looks like a burn. Is it possible that a medicine or chemical would have gotten onto the skin that left a chemical burn? Any how… we are glad that he is doing well. Continued prayers for healing! My husband had several burns that looked very similar to that after his liver transplant. One was about that size, the others smaller. In light of the fact that he had a gigantic incision, those burns seemed insignificant, but if that was all he had going on, they would have been very bothersome. They made for quite a sore when they broke and began to heal. No one could (or would?) explain where they came from. Who knows what goes on in the OR? We always assumed they were some sort of chemical burn. Rudy continues to be in my daily prayers. I was so glad to year some positive news come out of his latest procedure. Disgusting! I bet Joe will pay a few hundred bucks for the first person willing to stick a straw in it and….. 🙂 Love you, Geylings! It looks like the water blister that formed on our daughter’s thigh after she ran into nettles on some family island property we have on Puget Sound. The doctor said that it was an extreme allergic reaction, . . . but I like the alien thingy too. Waiting for an update. I am concerned! The red streaks and his toe don’t look good. I would think it would be best to take care of it in a controlled situation rather than have it pop. Or explode. Tsunami! I wondered what that bright red glow was out there in Goleta. All is explained. Prayers for healing now ascending. I wish him a future of less blisters. Ideally, no blisters.